Description: Commanding Federal troops during the engagement of Goldsboro, Brig. Gen. John G. Foster was a West Point graduate, veteran of the Mexican War and commended brigadier of the recent Burnside Expedition. Confederate forces forming the thin gray line were commanded by Brig. Gen. Thomas Clingman, who was a former U.S. Senator from North Carolina. A successful lawyer and articulate orator, Clingman was a Fire-Eater and one of the most outspoken politicians of his era. His proslavery position and ironfisted speeches on states' rights, which included the following quote, had chimed throughout the halls of Congress: "Do us justice and we stand with you; attempt to trample on us and we separate!" 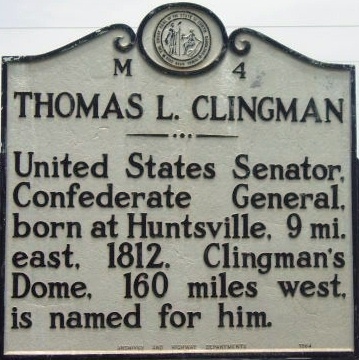 Clingman initially commanded the 25th North Carolina Regiment, a unit popularized with the movie Cold Mountain starring Jude Law as Private W. P. Inman (he really did exist). The former U.S. senator would later, at Gen. Lee's request, advance his battle-hardened brigade, known as Clingman's Brigade, into the thick of the fight at Cold Harbor and assist in the routing of Union forces. On December 17, Foster’s expedition reached the railroad near Everettsville and began destroying the tracks north toward the Goldsborough Bridge (as it was spelled at the time). Clingman's Brigade delayed the advance but was unable to prevent the destruction of the bridge. His mission accomplished, Foster returned to New Bern where he arrived on the 20th. This battle was the high water mark of the Goldsboro Expedition (aka Foster's Raid). It was also important because it demonstrated that the Union forces had the ability to advance from the North Carolina coast, through eastern North Carolina, and push inland to the vital and strategic railroads at Goldsboro. Result: Goldsboro was a major rail line for the Confederacy. The goal of the Goldsboro Expedition, aka Foster's Raid, was to capture the railroads while Burnside attacked Lee at Fredericksburg in 1862. The Atlantic and North Carolina railroad intersected at Goldsboro with the Wilmington and Weldon railroad (the lifeline of General Lee's Army of Northern Virginia). Foster attacked Goldsboro in December 1862, burned the railroad bridge, but did not actually take the town. Upon burning the bridge, Foster and his troops left for New Bern. The railroad was interrupted, but only briefly, because enough of the bridge was left intact to repair. 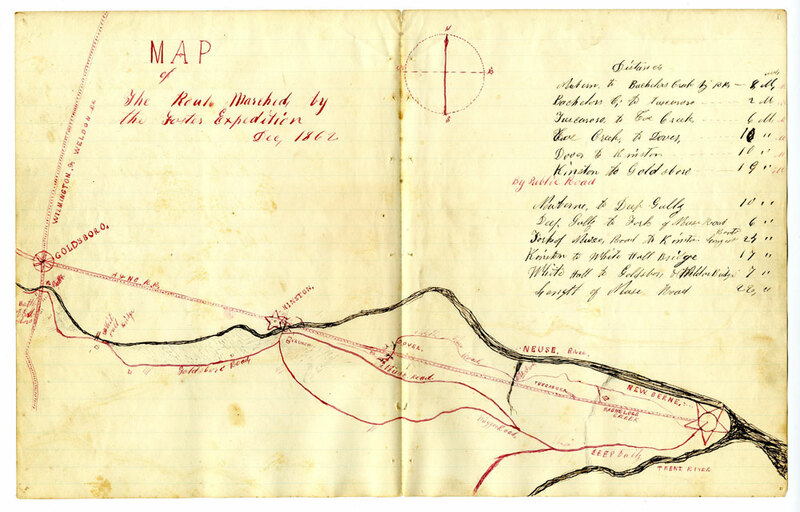 (About) Newton Wallace, Company I, 27th Massachusetts Infantry, drew this map of the route the Foster expedition took through eastern North Carolina, moving from New Bern to Goldsboro in December 1862. It includes towns, railroads, roads, water features, and a list of distances traveled. The Battle of Goldsboro (sometimes spelled “Goldsborough”) Bridge, noted on the left-hand side of the map, took place on 17 December 1862. Courtesy Wilson Library, UNC Chapel Hill.